The deportees were brought into the country through the Murtala Mohammed International airport, MMIA, Lagos at about 12.32am. Among the deportees were two infants of five months and 14 months old, 12 teenagers, 13 young women and 61 young men. 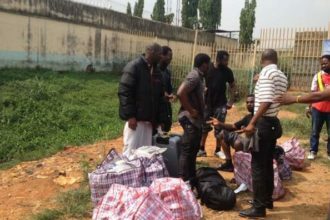 Seventy-seven of the deportees were from Edo State, eight from Delta State, three from Imo and Lagos States while Kano and Plateau States had two and one returnees respectively. The deportees were earlier expected into the country at 3:05pm on Monday, but their arrival was delayed till the early hours of yesterday. The deportees were brought into the country through Nouvel Air Airbus 320-214 with the registration number: 177Y. Speaking on the deportation of the Nigerians, the South-West Zonal Coordinator of the National Emergency Management Agency, NEMA, Mr. Iyiola Akande, said the repatriation was facilitated by the International Organisation for Migration, IOM, with the support of the Tunisian government. The returnees were received by various agencies such as the Nigerian Immigration Service, NIS, which checked their identities to ascertain their nationalities, the National Agency for Protection and Trafficking in Persons, NAPTIP, the police and other stakeholders.